Where you plant basil will have a big effect on how well it grows and how much you can harvest throughout the year. 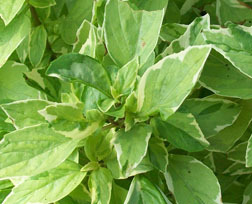 Basil needs full sun, which means at least four hours of direct sunlight. Don’t plant it in partial shade and convince yourself it will do just fine. It may survive but it won’t grow vigorously. Ditto on growing it indoors. Unless you have it positioned close to a full-spectrum grow light it will grow poorly. Even the sunniest window in your home will not – I repeat not – give it the sunlight it needs for good growth. Basil is a water-hungry herb. Whether in a container or in the ground it needs an inch a week – in other words, a good soaking. During the heat of summer, container grown basils may need even more frequent watering. But don’t water so much that the soil is constantly moist or – worse yet – soggy. Too wet soil can damage the roots and eventually kill your basil. Before drenching your basil check to see if the soil needs watering. Push your index finger into the soil until the first knuckle is buried. If the soil at the tip of your finger is drying out, it’s time to water. If the soil feels moist or wet, wait a while. 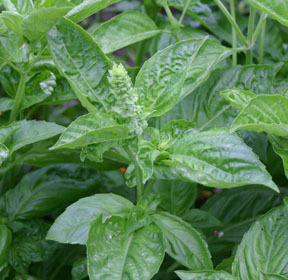 Basil is more often killed from too much water than not enough. Any plant that is being harvested will benefit from fertilizer. This is especially true of something like basil that you want to harvest several times throughout the growing season. Container grown basils should be fertilized monthly. Basil growing in the ground should be fertilized every time you clip off leaves. This is where some people make a big mistake. They wait until the end of season and make a big cut to harvest the leaves. Yes, you get a large amount of basil but your total harvest will be more if you harvest several times throughout the season. Each time you clip basil, it stimulates new, bushy growth. Regular harvest also ensures that you have the freshest leaves when you do harvest. If you wait until September or October to harvest, the lower leaves will be old ones that appeared on the stem back in April. 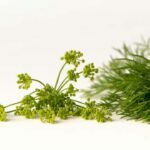 Herb leaves lose flavor as they age. The fresher, newer the leaf, the better the flavor. Want big harvests? 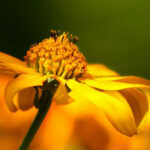 Plant in full sun, water regularly (but not too much), and fertilize to stimulate growth. This will give you lots of fresh basil all season long. I am SO sorry to hear that, Liz. Snails love juicy plants like basil. When you plant again try snail bait or, if you prefer, diatomaceous earth (available in most nurseries that carry organic gardening supplies). Don’t give up. Fresh basil leaves are worth the effort.